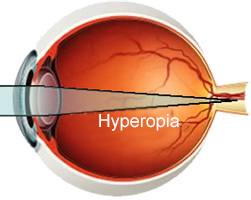 Hyperopia (longsightedness) is a vision problem where the eye is shorter than normal. In a hyperopic eye images are focused behind the retina, meaning that the image that reaches the retina and is received by the brain is defective, causing blurred, impaired vision of near objects, although above a certain age the patient may also have difficulty focusing on distant objects. The most obvious symptom is blurred vision, which is quite common in children, as the eye is shorter than normal at this age.